9" Length, 7/8" Handle Dia. Works with all fuel gases. There are pressure restrictions for different gases VanGuard torch handles are offered in extra heavy duty (H 315FC), heavy duty (315FC) and medium duty (100FC) models, and available in Victor’s most popular outfit models. VanGuard torch handles also feature Victor traditional threaded assemblies for economical repair if service is necessary. Victor torch handles have provided the foundation for welding, cutting, brazing and heating applications for decades. 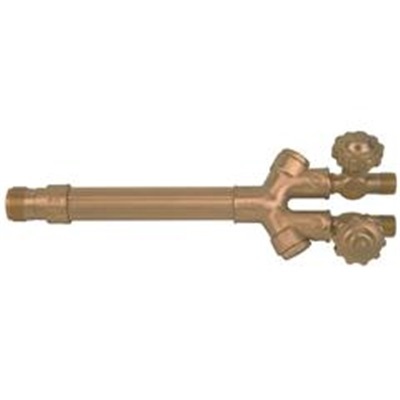 These heavy duty 315FC torch handles feature durable brass and stainless steel construction and threaded assembly design for ease of maintenance and repair. Victor’s proven and patented VanGuard series torch handles have flashback arrestors and built-in check valves to provide operators with optimum safety during welding and cutting operations. Handles cover the full range of welding, cutting and heating needs.